Our 20 Questions interview series finds us catching up with favorite people in comics on not just their latest works, but getting a little more about who they are and what they like at the same time (with a little bit of ridiculousness in the mix). Looking for in-depth, groundbreaking looks at the plot of a story they’re working on? You’ll have to look elsewhere, I’m afraid. I’ve been writing about comics for a little while now, and in my time, I’ve met a fair few people in comics at conventions and beyond. The secret about conventions is, despite the fun, they are crazy exhausting. Or maybe that’s because of the fun. Either way, they can feel like endurance tests at times, and by the end I’m typically ready for a week long nap. It takes a special type of person to keep your energy high the whole time both at the con and outside of it. No one pulls that off better than Aub Driver, the Public Relations Manager at Dark Horse Comics, a guy who rocks the cons with the absolute best of them. He’s been doing his thing at Dark Horse since I started writing at comics, but in his free time he’s got a side gig that’s pretty dang cool too: he’s the frontman of Portland metal band Jahai. In this week’s edition of 20 Questions, I talked with Driver about promoting comics, the changes he’s seen in comics, how Dark Horse represents Portland, the metal life, his favorite PDX food spots and concert venues, who has the best hair in comics, and more. It’s a fun talk with one of the coolest people in comics, as well as an insightful look at what a person in public relations does in comics. 1. You’re a Public Relations Manager at Dark Horse Comics. What does that mean, exactly? AD: “Public relations is a strategic communication process that builds mutually beneficial relationships between organizations and their publics.” In other words, I make the magic happen to ensure the company/creators are getting the buzz they want, need and deserve. I also hunt out new and interesting ventures across media (music, film, etc) that might bring something fun to the table. 2. Clearly you know what’s up when it comes to promoting comics. What do you think are the keys to promoting comics today? AD: A couple things factor into promoting comics. First, you need a stellar creative team behind the book. And that team needs to have a voice. If you don’t have a strong writer & artist, sales will suffer. Second, you need a crazy good/original story and you need to know who you’re selling to (target audience). And third, make sure the hype is there and the hype is real – everyone needs to read your book. This can come from other taste-makers in the industry or outside of the biz. If you know someone who can boost your signal, ask them. If you don’t, you better start making connections. Lastly, make sure your first issue is the best first issue you can produce, because series attrition is the winged beast you will ultimately fight. 3. You’ve been at Dark Horse for almost five years now, and I’m curious, what have been the biggest changes you’ve seen both in comics and in promoting them? AD: People were super worried about digital comics when I started. The digital market was absolutely on the rise, but is now on a big decline. Points to the fact that people are still buying print like crazy. The vocality of the internet is something which has gotten increasingly more active in the past five years. It’s getting people talking about a particular book or comic online to actually set foot in a comic shop that’s the hardest part. And in turn making sure the comic store that’s closest to them is carrying the title they want. One of the most crucial things about promotion is finding your indie adapters that are looking for something new and fresh and get them to shout about it. You’re constantly competing for shelf space in single issues and there’s a lot of very talented people creating funny books currently. 4. I have to applaud you: you’re the con king. No one I’ve met handles cons like you do. You’re like a Terminator. How do you keep the momentum going when you’re working the Dark Horse booth and beyond? AD: I appreciate you saying that. I think it often goes unrecognized by some of my colleagues. Like a liquid metal T-1000, I try to adapt to the convention I’m attending/representing. Cons are essentially all the same machine, the only thing that changes is the color of the carpet and how well organized it is behind The Great and Powerful Oz’s curtain. It’s also very much an endurance contest in many respects – you have to sustain your energy for a week. Eat hard, sleep hard. 5. There are all kinds of channels you can reach people on, but how valuable do you think social media is as an avenue for promoting comics? AD: For Dark Horse, I think it’s hugely valuable. Since we’ve seen so much social media growth in the past several years (and it’s not stopping) it’s important to talk directly to your consumer. And since comics is and always will be a visual medium – there’s no end of content to be shared amongst the social sphere. Some stuff works, some stuff doesn’t. Fan engagement and interaction is always going to work better than a call-to-action to “buy now”, but it’s finding a balance that reaches your audience that can help you win. And even then, people will stay say they never heard of “Archie Vs. Predator” or what have you because there’s just so much content competing for their eyeballs that they’ve got their blinders on. Goes back to what I was saying about having as many tastemakers crow about your series as possible. 6. You work at a big comic publisher in a big comic city. How do you feel Dark Horse represents PDX as a whole? AD: Portland is a comics town. It’s an artist’s town. A city nonchalant in it’s ‘cool factor’ while trying to avoid gentrification and at the same time attempting to La Vie Boheme. There’s so much raw talent here that wants to tell the stories they want to tell, create their art, drink good beer, eat good food, join the circus and perhaps attend Burning Man more than once. I think Dark Horse recognizes all of that and tries to embrace the “weird.” Keep things truly independent. 7. As a guy who works directly at con booths on the regular, you have great insight into that world. What are your favorite cons? And all of them is not an answer! AD: Oh man…Well without being too biased, all the ReedPop shows are fantastic. I hear they can be a little tricky for press/artists to get their foot in the door but from an exhibitor standpoint they are great. Solid organization from the top down. In order it would be… 1)New York Comic Con… 2) Emerald City Comicon… 3) San Diego Comic Con. I’ve got some love for Phoenix and Wondercon and C2E2 as well. All stellar shows. 8. I can’t survive work without a fancy coffee and good music. Day in and day out, what aids you most in crushing at your job? AD: “I like my coffee black, just like my metal” I listen to a lot of different music and drink a lot of Americanos. I put on my Sennheisers and rock out while pitching and writing. AD: It’s certainly hard to pick favorites in this business. I’ve loved Paul Tobin & Juan Ferreyra’s Colder from the beginning and they’re just about to start their final series arc. They also did our Prometheus book which was awesome. 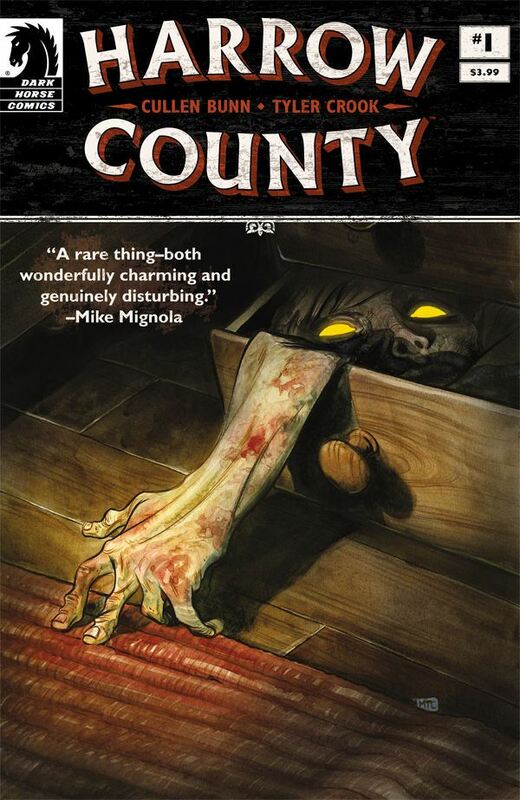 Cullen Bunn’s Harrow County is damn near mesmerizing. And if you just want an awesomely funny high-paced team book, you must read Donny Cates & Eliot Rahal’s The Paybacks. And it goes without saying you should be reading Chuck Palahniuk’s Fight Club 2. It’s your own fault if you’re not. 10. It’s a great time for comics, so it seems like it’d be a great time for promoting them as well. What gets you jazzed about promoting comics, specifically the ones at Dark Horse? AD: It truly is a great time – there are so many crazy stories to tell in sequential art. Personally, I get really stoked on a creative team that gets behind their book(s) and goes the extra mile to reach out to comic shops directly, comes up with out-of-the-box ideas and really makes me want to take their series to the next level. When I know that they’re excited, I get excited. And when I’m excited, I can make influencers need to read your comic, I can make people need to buy your comic. 11. I’d ask what you’d do if you weren’t working for Dark Horse, but you’re already doing it: being the lead singer in a metal band. What’s your favorite part about the metal life? AD: The metal life. I suppose the fact is that I’ve always loved performing since I was a little tyke and creating music is one huge catharsis – specifically metal music. The raw emotion that comes from shredding guitars/double bass drums/screaming your lungs out really helps exorcise the demons. Or keep them at bay. Favorite part? The performance. Least favorite part? Gig load out. 12. I’m a disaster around celebrities, but I know not everyone is like that. Is there a famous person who, if you met them, would make you turn into a stumbling, bumbling mess? What it truly boils down to is this: When I started my career, I was working in the music biz. The label signed Megadeth and on the day Dave Mustaine was coming to the office, my incredible mentor Jamie Roberts said to me “You work for the talent, you can still be a fan but you have to forget about that. They’re the client and you’re the one making the magic happen.” That same day, an intern was fired on the spot for going total fanboy on Dave. I kept my cool, kept my gig, and it’s been something I keep in the back of my mind ever since. 13. Portland is a food lover’s fantasy. What’s your favorite spot? AD: Dude. Seriously. So much good food in Portland. Depends on what you’re in the mood for. Genie’s for Brunch/Bloody Mary’s. For Pizza & Beer, you can’t beat Lonesome’s Pizza or the uber-metal Sizzle Pie. I’m a huge sushi fan, so I frequent the sustainable Bamboo sushi. And of course, the three places with the best views of the city in no order are Portland City Grill, Departure or Noble Rot. 14. There are also tons of amazing music venues in Portland. What’s the best place to play with Jahai? AD: Hawthorne Theatre, though terrible airflow, is always a fun spot. Dante’s or Star Theater are stellar venues we’ve rocked. The one place we haven’t yet tackled is the Roseland Ballroom — but it will come. 15. Metalhead by night. Comic guy by day. 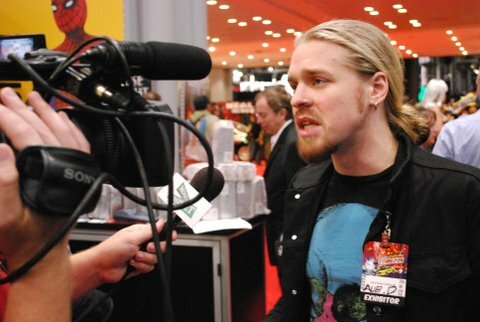 How did you first get into working in comics? AD: The entertainment business is all about who you know. I was fortunate enough to go to college with a gentleman who is now an editor at Dark Horse, but at the time was the executive assistant. He was waving a flag that a PR position was open and I went for it. I’d loved comics as a kid, so I brushed up on my history and ended up landing the gig. I did my first convention within 30 days on the job. 16. 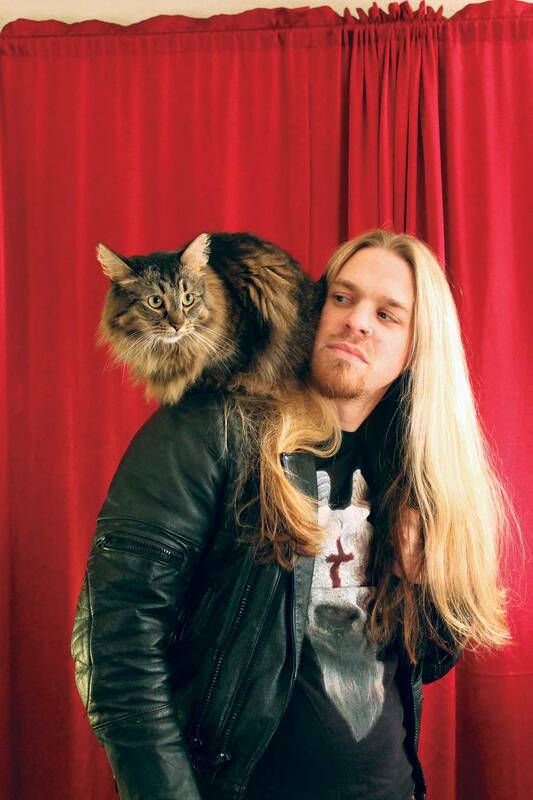 You were featured in a book of photography called Metal Cats. How did that happen and was that your cat on your shoulder? AD: Absolutely, that’s my fabulous forest cat, Freya. She’s awesome. Long story short, I’d been following Alexandra Crockett’s project as it was coming to life and she hit the road to do an I-5 tour from Oakland to Vancouver, BC and hit all the big cities along the way. We shot for an hour when she visited Portland and when I asked what the plan for publication was she said she was going to self-publish. I knew it had “viral” written all over it. I told her I had some publisher connects and put her in touch with a colleague at powerHouse Books. The rest is history. Beautiful metal portraits with their furry feline companions. And for a good cause – proceeds went to several west coast no-kill shelters. 17. Everyone’s got a softer side, even metal band frontmen like yourself. What do you do to unwind when you’re not pitching comics and playing tunes that might surprise people? AD: I 100% fully endorse sensory deprivation float tanks. I try to float when I come back from conventions because there’s so much sensory overload with the colors/sound/etc. that submerging in salt water for 90 minutes without any light or noise is just about as close to peace as I ever get. You can see some crazy stuff in there…Your mind plays tricks on you while your brain resets. To me it feels like the equivalent of sleeping for 12 hours, with my eyes open, floating weightless, in the nether. 18. If you had to choose one, what metal band is the greatest of all time? Slayer gets my honorable mention. And Black Sabbath is just a given. 19. Besides you – obviously – who would you say has the best hair in comics? AD: Dude wise? No one has better hair than me. Well, Dirk Wood does come close. And I simply can’t judge the ladies. 20. If you could live your dreams, what guest would join Jahai on stage during a gig? AD: Well, dreams being dreams – Dimebag Darrell. In reality, would be awesome to do something with Speed Strid from Soilwork/Night Flight Orchestra, truly a vocalist’s vocalist.